In 2011, MyShelter Foundation created the Liter of Light programme which aims to provide poor communities in the Philippines and around the world with a cheap source of lighting that can be produced and distributed locally. Recycled plastic bottles filled with water and a bit of bleach are fitted into the roof to provide lighting during the day and can be upgraded with an LED bulb, micro-solar panels and a battery to provide a low cost night lighting system. Liter of Light was conceived as an open-source, DIY programme that could easily be replicated by anyone around the world using readily available materials and basic carpentry/electronics skills. Within 20 months of its inception, Liter of Light had become a global movement benefiting more than 150,000 households in the Philippines, and 350,000 homes in 15 countries. Liter of Light uses cheap, readily available materials to provide high quality lighting to homes in poor communities. Recycled plastic bottles filled with water and a bit of bleach are fitted into the roof to provide daylighting and can be upgraded with an LED bulb, micro-solar panels and a battery to provide a low cost night lighting system. Liter of Light works with the local community to produce the lighting systems creating jobs locally. By embracing social media and the philosophy of open-source technology, the project has grown from nothing to lighting up 160,000 homes in the Philippines and has now spread around the world. The use of plastic bottles as a way to provide indoor lighting from sunlight, developed by Alfredo Moser of Brazil in 2002, has inspired MyShelter Foundation to use the technology as a social enterprise. MyShelter Foundation (MSF) is an NGO established by social entrepreneur Illac Diaz in 2006 that aims to create sustainability and reliability through capability-building and employment-generating projects. 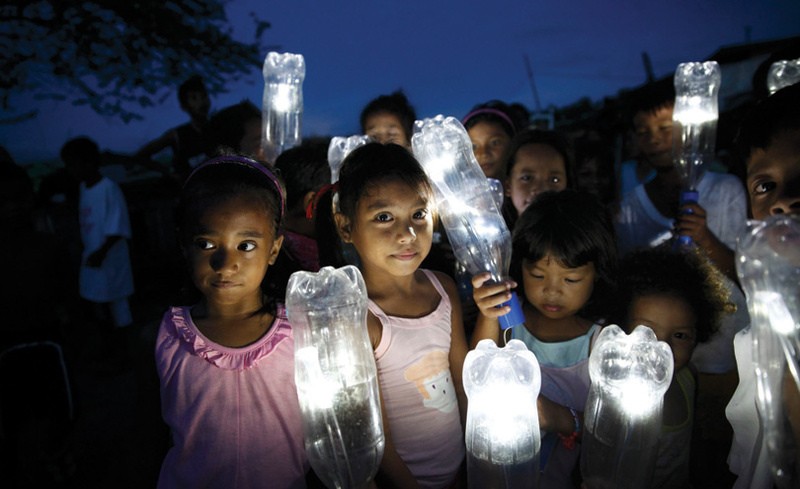 MSF launched the Liter of Light in 2011 in the Philippines in cooperation with students from Massachusetts Institute of Technology (MIT) and Alfredo Moser. To help the idea to grow sustainably, MSF implemented a “local entrepreneur” business model whereby bottle bulbs are assembled and installed by local people, who can earn a small income from clients for their work. Liter of Light aims to provide poor communities in the country with a cheap source of lighting that can be produced and distributed locally. It was conceived as an open-source, DIY programme that could easily be replicated by anyone around the world using readily available materials and basic carpentry/electronics skills. Rather than relying on large-scale, imported or patented technologies, the project sought to create a grassroots green lighting movement starting from the principle that anyone can and should become a solar engineer. Hundreds of millions of people live in informal settlements worldwide. 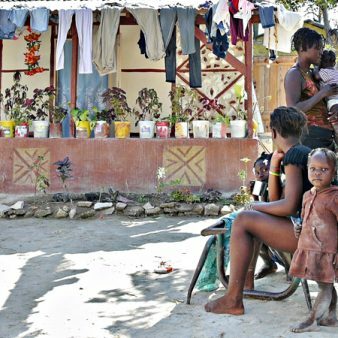 Many of these dwellings lack windows or adequate lighting and residents often resort to kerosene, candles or inventive wiring for light, risking health and safety in the process and many simply go without. Proper electricity is not usually an option, especially in the Philippines, where twenty million Filipinos (a quarter of the population) live below the poverty line. The Philippines has the highest electricity prices in Asia and suffers constant blackouts due to outdated power plants. The country is also vulnerable to extreme weather events resulting in loss of life and destruction of property and infrastructure. Typhoon Haiyan, which struck in November 2013, one of the strongest tropical cyclones ever recorded, destroyed 14 million houses and pushed millions of people into further poverty. The project has been helping the rehabilitation of areas affected by the typhoon by providing training and solar bottle nightlight kits (for homes and streets) to local partners and grassroots entrepreneurs. Liter of Light (Day) is an affordable DIY lighting system that allows the sun’s rays into homes, schools and public centres for US$2 per unit. Using recycled plastic bottles, 10 ml of bleach and distilled water, the bottle is placed through galvanised steel roofs . Sunlight refracts through the bottle to light the space below with 55-watt of brightness. In 2012, Liter of Light (Night) began by using the database of households with the daylight bottle bulbs in their roofs, offering a package of upgrading this to a 1-watt ($10/unit) or 2-watt ($15/unit) LED with micro-solar panels and battery which would give another 10 hours of light at night. With a simple circuit panel, drill and soldering, the night solar LED light is built and inserted into the already installed bulb. The project works with women’s cooperatives to make solar nightlights from a handful of parts, including both recycled components and a new high-tech chip guaranteed to make the light last 70,000 hours. The water bottles are covered with handcrafted woven shades, providing a new outlet for local basket-weaving skills, which are otherwise no longer in demand. Replication is done by equipping local partners or grassroots entrepreneurs with basic tools to build and install daylight bottle bulbs, and teaching them to build solar nightlight upgrades through purchasing kits from MSF or by sourcing other parts locally. Step-by-step guides on materials and installation are available online through video tutorials and social media in order to facilitate use and replication of the technology. 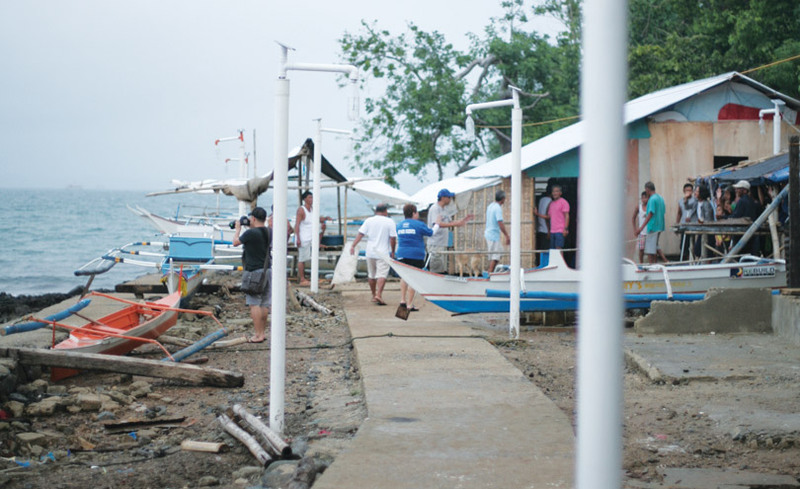 Roche, Inc. and Pepsi provided a start-up grant of $57,000 to provide training to communities and also gave grants to help rehabilitate the areas affected by Typhoon Haiyan. As of 2014, Liter of Light is funded by dual cash flow from donations of $159,090 from Roche and $15,230 sales income. This came from the sale of finished lights or kits sold to other NGOs where MSF provided training on how to make lights. Liter of Light began with one carpenter, one solar bottle bulb and one paid installation in one home in 2011. Within months, the project had completed 15,000 solar bottle bulb installations in 20 cities around the Philippines and had begun to inspire local initiatives around the world. To date, more than 145,000 installations in 100 cities in the Philippines have been completed. The simple lighting technology creates local jobs, teaches green skills and empowers local communities. Residents are able to save an average of $10 in electricity bills a month by installing the solar bottle day bulb. They can use this saving to upgrade to the night bulb (costing $10) which allows them to further save on electricity bills. This allows them to have more disposable income to pay for critical needs. Liter of Light is uplifting the quality of life of thousands of impoverished families in the Philippines who have no access to electricity and use dangerous kerosene lamps indoors, which provide poor light, pollute and cause respiratory problems and fires. With the solar bottle bulbs, residents do their chores and activities efficiently inside a brighter home. Having affordable lighting not only improves the living environment of urban and rural poor families but also allows children to do homework and read at home. Due to high electricity prices, local government officials could not afford to light up their streets. This was made possible by the project’s affordable solar bottle streetlamps ($60 each) which helped improve the public perception and attractiveness of neighbourhoods and addressed security issues. Many mayors around the country have also supported the start-up of local social enterprises with the project’s solar streetlights and houselight kits to alleviate the shortfall of energy supply in their towns/cities. In partnership with the Technical Education and Skills Development Authority (TESDA), a government entity that trains young people and workers, the project has trained 572 volunteers, mostly women and disabled people and a number of local government units and non-profit organisations in building solar streetlights and houselights. Through social media and easy replication, the movement has spread to more than 160,000 households in the Philippines and inspired local initiatives around the world lighting up 360,000 homes in over 15 countries. The project has been replicated in 15 countries (Argentina, Bangladesh, Brazil, Colombia, Egypt, India, Kenya, Mexico, Nepal, Pakistan, Peru, Spain, Switzerland, Tanzania, Uganda and Zambia) via partnerships with social enterprises that raise their own funds to run the project in their respective areas. Each country in which the project operates has developed its operations and programming at a local level but shares technical knowledge, conducts troubleshooting and crowd-sources innovations to the technology through regular coordination calls, skype, emails and social media. The project’s innovation lies in its utilisation of cheap, durable and readily available materials to produce high quality lighting enabling the urban poor to have access to an affordable, environmentally friendly, long-term alternative to electric light for use during the day and night. Liter of Light provides enough initial supplies and volunteers to generate interest but its focus is on teaching a community how to manufacture and install the solar bottle bulbs, with the end goal of creating green microbusinesses. By embracing social media and the philosophy of open-source technology, the project has grown from lighting up 160,000 homes in the Philippines to providing solar lighting to communities around the world. Liter of Light is a zero-carbon-emitting alternative to the use of electric or hydrocarbon-burning (kerosene/gas) illumination. The materials used are readily available, e.g the reused plastic bottles, needing no additional manufacturing resources. Discarded plastic 1.5 to 2 litre bottles are reused and upcycled to a lighting system, helping reduce plastic waste. With a bit of bleach to prevent mould and just enough distilled water to fill the bottle, the solar bottle daylight bulb produces 55 watts of brightness through sun refraction and will last up to five years before being replaced. The LED bulbs in the nightlighting system have a longer lifespan and higher energy efficiency than incandescent/fluorescent lamps. Each daylight bulb saves 200 kilos of carbon emissions a year, and each nightlight bulb saves 350 kilos in carbon emissions a year. Compared to a kerosene lamp which emits 20 times more black carbon with 7-9 per cent of fuel burned converted into black carbon particles (black carbon is known to be a very powerful absorber of sunlight, far more than carbon dioxide). The corporate partners help to increase the impact of the project through donations which increase the number of kits that MSF is able to produce but these donations are time-limited, usually of one-three years in duration. But the income gained through sales is rising. 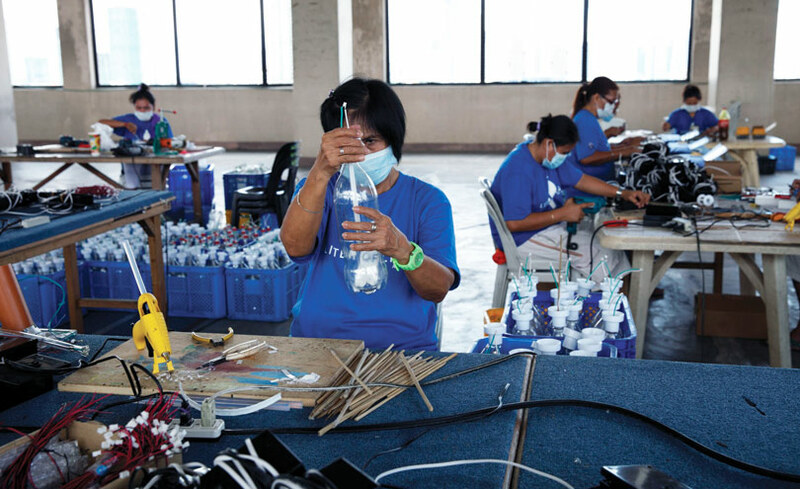 By working with a local partner, Design Centre of the Philippines (the national institute for product design), the project now creates marketable lamps with woven designs for the solar bottle bulbs enabling them to charge a premium rate. With simple training and tools, local partners and grassroots entrepreneurs could easily replicate and install the solar bottle bulbs earning $0.50 from clients per bottle bulb installed. Products are available in micro-stores in neighbourhoods and the project supplies kits to these stores. Partnerships with national and local government agencies, institutes, non-profit organisations and private companies enabled the project to be replicated in towns and cities nationwide. The project aims to install 15,000 solar bottle lights in the provinces affected by Typhoon Haiyan in 2014 and to expand the programme to energy poor areas in 12 provinces by 2015. The project is coordinated with local organisations and communities, who are given initial training. Technicians work with them by providing further training and undertaking installations. In order to lower installation costs, the local residents or organisations usually collect and provide the used materials e.g. pre-used soda bottles for the solar bottle bulbs. Residents help each other during the collection of materials and installation of solar lights. Most of the 350 affiliates working with the production and assembly of solar night bulbs are women’s cooperatives. The project also trained disabled people and economically marginalised groups to build solar lighting products. MSF has established a training centre that conducts workshops with young people, companies and other groups interested in volunteering their time to build lights in their communities. The project also partnered with technical schools and prison facilities to equip women with marketable skills in electronics increasing their employment prospects once they complete their skills-based programmes or become reintegrated in the workforce. Using appropriate durable, leak-proof, space-filling glue is one of the main challenges. Many local groups are experimenting with different glues to find the best solution for both cost and quality; silicone-based or polyurethane glues have usually been found to work best. Several villages experienced problems with the early version of the linked in batteries series where one battery drained and had to be completely replaced at the project’s expense. Through trial and error, the correct parallel connection is now used. Access to knowledge on product improvement is limited as there are only a few specialists in the country. The project tries to overcome this by trial-and-error learning and seeking partnerships with specialists and training agencies. The project currently experiments with assembling solar panels out of readily available SunPower solar cells and, though a slow process, is learning how to cut the solar cells and assemble connectors by hand. The Liter of Light (Night) was built with rudimentary knowledge in mobile chargers and solar lighting. It would have been better to look for partnerships earlier in the process to speed up product development. Despite their benefits, there is still not much financial support (e.g. tax exemption or assistance programmes) from the government for green technologies such as solar energy. A person’s life can be made dramatically better through simple solutions that are affordable, use local materials, are easily replicable and generate sources of income. The use of the internet and social media for sharing instructions/information about the project and for the coordination with partners has proven to be very successful to disseminate ideas. The project has a database of the families with the daylight system and families are advised to keep a record of their electricity bills to monitor their savings. After two to three months of installation, the project revisits the families, surveys them about their energy savings and also offers them a package to upgrade to the nightlight system. MSF has not yet carried out an evaluation of the whole Liter of Light project in the Philippines. MSF began with one carpenter, one solar bottle bulb and one paid installation in one home in 2011. 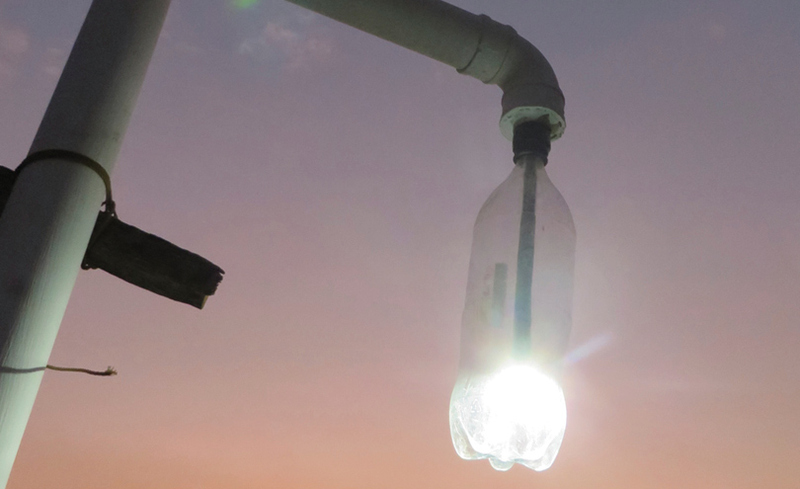 Within months, the project completed 15,000 solar bottle bulb installations in 20 cities around the Philippines and began to inspire local initiatives around the world. To date, more than 145,000 installations in 100 cities in the Philippines have been completed. The project aims to install 15,000 solar bottle lights in the provinces affected by Typhoon Haiyan – Cebu, Iloilo and Leyte – in 2014 and to expand the programme to energy poor areas in 12 provinces by 2015. Local and National: MSF’s work and the success of the Liter of Light have been possible through partnerships with national and local government agencies, institutes, non-profit orgs and private companies. These partnerships enable the project to be replicated in towns and cities nationwide. International: Liter of Light is a network of partners sharing sponsors, best practices, and successes (or failure) in fundraising and community implementation. The project has been replicated in 15 countries (Argentina, Bangladesh, Brazil, Colombia, Egypt, India, Kenya, Mexico, Nepal, Pakistan, Peru, Spain, Switzerland, Tanzania, Uganda and Zambia) via partnerships with social enterprises that raise their own funds to run the project in their respective areas. Some countries have made small adaptations to the design. In countries where battery or solar cells are unavailable, MSF ships them these materials with samples and instructions and shares with them information about the suppliers. Liter of Light’s open source approach and support to develop the programme in other communities has led to a growing number of projects around the world. See their interactive map pinpointing Liter of Light projects. In 2016, Un Litro de Luz Colombia further developed the solar powered streetlights by installing a Wi-Fi modem and router to the bottle, to provide internet service to the community. The cost of the installation is met by private enterprises with residents paying less than $0.10 per hour to use the internet. The new streetlights are currently installed in a school in La Guajira district, providing free internet to indigenous Wayuu children, and in Ciudad Boliva, one of the poorest neighbourhoods in Bogota. With this innovation, Un Litro de Luz Colombia aims to develop free lighting and low-cost internet services to rural areas in the country. A free World Habitat publication about how Liter of Light is lighting homes and lives one bottle at a time is available to download.